This past week I spoke to someone who I haven't been in touch with for a very long time. I knew she had sold her home and moved into a condo with her husband. As time went on she saw changes in him and realized it was time to make another move. Their choice was an Erickson Community on the North Shore. 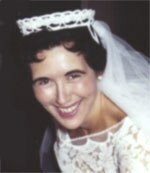 Two years after their move her husband passed away. By this time she was settled in a community that provided much support for her. 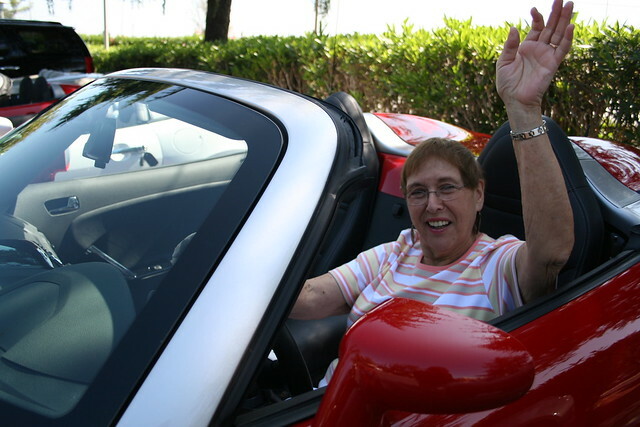 She is a very outgoing and down-to-earth person and has made many friends and life is good. This past Saturday a concert was being held at her community and she invited me and my friends to attend. I accepted her invitation not so much because of the program but because it would give me an opportunity to see "the place" again. A few years ago I attended promotional lunches and ice cream parties there but was not ready to make the move. Recently I was thinking "I'm too old to make the move." Well, when I saw the residents that attended the concert, I don't think I'm too old! Maybe they are younger than me but they looked older. My friend introduced me to a few of her friends and they were all very enthusiastic about their lifestyle. Others that I spoke with felt the same way, they love it! I told them that I think the kitchen must be putting "happy pills in the food." Two of the ladies invited me to see their apartments. Wasn't that nice of them? One apartment was a one bedroom and the other was a very large two bedroom. To quote my friend, she says, "Millie run don't walk, Do it." I saw this one a while ago. Wanted to take the easy way out today - nothing special to write about - this is a goodie. Your kids are becoming you...and you don't like them...but your grandchildren are perfect! When people say you look "Great"... they add "for your age!" The 5 pounds you wanted to lose is now 15 and you have a better chance of losing your keys than the 15 pounds. You realize you're never going to be really good at anything.... especially golf. Your spouse sleeps better on a lounge chair with the TV blaring than he or she does in bed.It's called their "pre-sleep". Remember when your mother said, "Wear clean underwear in case you GET in an accident"? You miss the days when everything worked with just an "ON" and "OFF" switch.. Your husband/wife has a night out with the guys or gals but is home by 9:00 P.M. Next week it will be 8:30 P.M.
Notice everything they sell in stores is "sleeveless"?!!! you'd give anything if he/she would find a job! Which one's rings a bell with you? For me, most of them hit home! I'm sure the first thing you are going to think is, how could she have an enjoyable visit with the dentist? The reason I made an appointment with the dentist was that I wanted him to take a look at one of my back molars that felt scratchy when I ran my tongue over it. 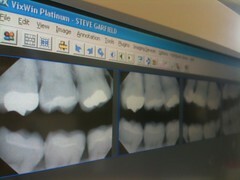 I suspected that I would need a crown and sure enough that was the diagnosis, a good part of the tooth was broken. "Did I want to take care of it then and there?" Yes, I was there, had the time and wanted to get it taken care of. It's been a long time since I had that type of work done and remembered that it took a few visits, was expensive, I experienced some pain and found the procedure uncomfortable. Well, it was a totally different experience! There are new methods now and it's all done in one office visit. It did take 2 1/2 hours but let me tell how I spent that time. The dentist has a setup where you can watch a movie while "all the work is being done." 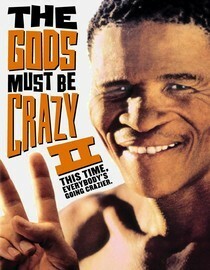 He pulled up Netflix - foreign films - I spotted "The Gods Must Be Crazy." I remember seeing that movie in the 80' and loved it - Time to see it again! I didn't need goggles, just a headset. He started his work and I concentrated on the film. Loved the beginning of the film where the elephants, lions, tigers and giraffes were prancing around in the desert. 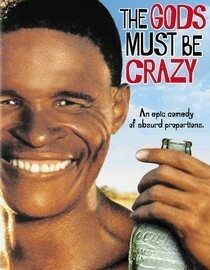 As the film proceeded I kept looking for the "big" moment in the movie where the African bushman finds a coke bottle that was thrown from a plane and causes all kinds of problems for the bushmen who think that it was dropped from the heavens by God. Never saw that scene in this film. I finally figured out that the movie I was watching was a sequel. It was not as good as the original film but it was funny, had many slapstick scenes and some touching moments. Sometimes I laughed out loud while I had all the stuff in my mouth! All's well that ends well. The dentist did his job and I saw an enjoyable film. Now I want to tell you why I was so responsive to my visit to the dentist. attended a memorial service for a friend, and attended a funeral for a relative. So, that's why I can say I had an enjoyable visit with the dentist. At least no one was sick. The only pain I experienced on that day was "a pain in the checkbook!" In Massachusetts we have all kinds of winners. 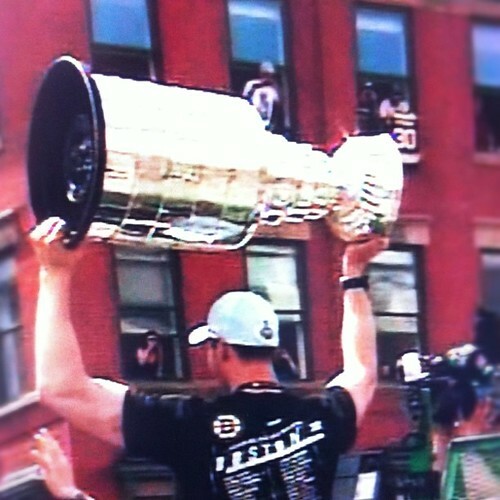 This season "The Boston Bruins" won the Stanley cup after 19 years! We were very excited and happy about that. That's one kind of winner - today I want to tell you about a totally different kind of winner. The Boston Globe has been conducting a Recipe Box Project where readers are asked to share their favorite recipes. Years ago the Globe had a column "Confidential Chat" were readers sent in their favorite recipes. As a matter of fact I have a scrapbook containing many of their wonderful dishes. 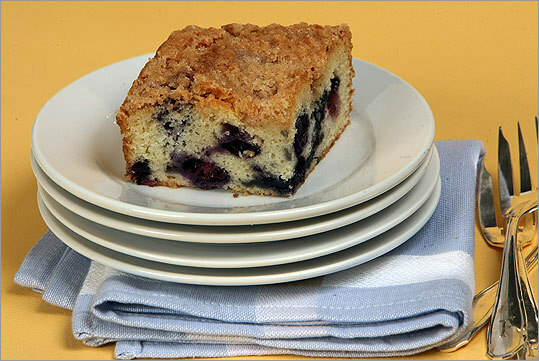 Recently they had a blueberry cake contest and it was discovered that the original recipe appeared in the Chat column decades ago sent in by "Cakes and Cookies." I have many recipes by her, she was my favorite lady! Read more on this story: This winning blueberry recipe sure has gotten around. There is only one TV show that I make it my business to watch, "Men of a Certain Age." It's on Wednesday nights at 10/9c on TNT. What makes "Men of a Certain Age" so interesting to me is that it's about three middle aged guys who each have their individual problems. They are guys just trying to deal with life in their mid fifties. Joe, played by Ray Romano (Everybody Loves Raymond) is an easy going guy who is divorced, owns a party store, and is trying to control his gambling addiction. He's finding life as a single person at this time of life is not to his liking. Terry, played by Scott Bakula (Quantum Leap) is a single guy who is still playing the field, no longer trying to have a career as an actor, and working as a car salesman. His heart is really not in it. Owen, played by Andre Braugher (Homicide: Life on the Street) is a happily married man. His father retired from the Chevy dealership that he owned and put his son in charge of the business. Dad does not approve of anything the son does. The performances are so real, I feel like I'm peeking in on their private lives. They are not bad guys, they are just guys trying to find their way through some difficult times. Sometimes there are laughs to be had, but mostly "it's serious business." There have been a few episodes where I have come close to tears! I have read that the show has been struggling in the ratings, and it may lose the battle. Have you heard about the show? Have you watched it? 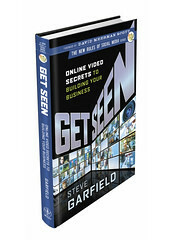 If you haven't looked in on it, try it you might like it!